UK-based Rock is well known for its high-performance gaming laptops and offers the latest components housed within generic chassis designs. The Xtreme 790 brings Intel's Core i7 technology to the range and provides truly stunning levels of quad-core power. 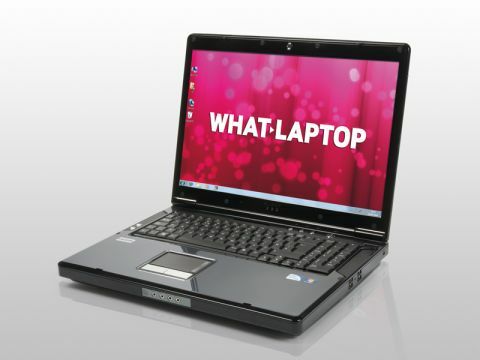 Powered by an Intel Core i7 920 processor, performance goes beyond what you would expect from a laptop. Running at 2.66GHz, the CPU is backed by a staggering 6144MB of high-speed DDR3 memory and vastly outperforms every laptop that we've ever tested. When running standard 32-bit applications, performance is outstanding. It is when running 64-bit software designed to fully utilise its multi-core CPU that the Rock really shines, however, dispatching complex tasks with a level of ease that we have never seen before. To accommodate such powerful components, the chassis is one of the bulkiest on the market. Its 66mm depth and 5.2kg weight mean you'll struggle to move it far from your desk, as will the awful 81-minute battery life. Built by Taiwanese manufacturer Clevo, the generic design lacks style, but proves resilient enough for regular use. A combination of four large fans and vents on the base of the chassis keep the system suitably cool, without proving noisy. Graphics are provided by a top-of-the range Nvidia GPU for impressive gaming power. In a chassis this large, it is a shame that Rock hasn't used two cards in an SLI configuration, as the extra performance would have perfectly complimented the high-powered quad-core CPU. The 17-inch Super-TFT screen has a 16:10 aspect ratio, rather than a 16:9 true widescreen design. Quality is excellent nevertheless, with sharp and vibrant images on offer. The panel is not as bright as we'd have liked, but it is still ideal for gaming and home entertainment use. The keyboard is located quite far back on the chassis, forcing the user to lean forward slightly to type, but usability is otherwise excellent and all keys move smoothly and responsively. Finally, extra features are fantastic. An integrated hybrid tuner is fitted for watching and recording TV, 802.11n Wi-Fi and Gigabit Ethernet provide high-speed network connectivity and a three year on-site warranty is included for comprehensive at-home repairs. Overall, the Xtreme 790 is a mixed bag. While performance is outstanding and is backed by strong usability and features, the lack of SLI-graphics is an odd omission considering the machine's size and price. If you're seeking the most powerful laptop around though, this is it.